Your password reset link has been sent on your email address. eMaximation's easy-to-use sales and marketing software helps you capture, qualify, and convert more leads into sales. Align and streamline sales and marketing through automation like never before. Automatically capture and distribute incoming leads to ensure quick follow up and get the right leads to the right team members. Intelligently identify prospect lead scores based on custom business rules for lead qualification and follow up, and automatically prioritize and queue up activity lists for sales team members. Email nurturing provides drip campaigns to ensure a quick response with new prospects while keeping a spotlight on past candidates through automation to ensure no opportunity is lost. Sell more top-of-mind and streamline collaboration with real time lead alerts, knowing the exact moment prospects are engaged in marketing collateral and automatically updating team members on all sales and marketing activity. Track and Analyze every aspect of your sales and marketing efforts from cost measures to time frame analysis, pipeline reports, demographics, and much more. Our sales and marketing expertise as well as a disciplined focus on customer service and implementations helps our clients maximize user adoption. Capture every lead instantly from any 3rd party web portals, your corporate website, or lead lists as file uploads to ensure quick follow-up times and to eliminate manual efforts of data entry. Lead Parsing: Email notifications with prospect information can be parsed into eMaximation from 3rd party web portals or your own corporate website automatically. API Form Post: 3rd party lead providers and your corporate website can easily connect with our API interface to post new lead information directly into the system. Web Services Integration: Send and receive prospect information and downstream process data with other company systems to analyze business trends across departments and streamline collaboration. Automatically distribute and segment prospects to team members and MaxGroups eliminating manual efforts and insuring consistency with lead assignment and email communications. Robust routing engine that can assign leads based on demographics, financials, round robin, weighted and capped measurements, or any other custom form data captured. MaxGroup design for segmenting leads based on your business strategies and team structure such as territory assignment, lead qualification measures, different departments, business concepts, and much more. Custom business rules unique to MaxGroups for email campaign delivery, lead routing, team member access, and lead alerts. A critical component to help sales quickly and easily identify the hottest prospects, while automatically prioritizing marketing campaigns and follow-up tasks. Identify which prospects and leads are most interested and qualified, and automatically assign positive and negative scores based on demographics, campaign behavior, custom candidate ratings, pipeline status, lead source, and more. Automatically prioritize task follow up for sales team members based on lead score and your own unique standards for lead qualification and follow up processes. Automatically notify sales agents as to the next best activity from the priority follow up list. Tie marketing campaigns into lead scoring and priority to tightly integrate your marketing strategies and selling efforts. Our email nurturing software is integrated right into our lead management system, which allows marketing to support sales like never before. By keeping a long-term spotlight on the front end of the selling cycle through marketing automation, your sales team stays focused on the hot, ready-to-buy prospects, and no opportunities are lost. Click and create template design for email messages and HTML landing pages for high impact media. Schedule email delivery at intervals of your choosing. Send targeted emails from any segment of sales reporting or candidate lists at a batch level. Automated, revive email campaigns to stay focused on leads with longer buy cycles. Link to URL's, private landing pages hosted on eMaximation's server, or marketing collateral documents. Send process specific communications automatically based on sales pipeline activity to save time and insure consistent delivery and messaging. Improve team collaboration and increase sales with real-time email alerts on prospect activity marketing campaigns, and as milestones are reached in the sales process. Fully customizable; text based or HTML formatting. Know the exact moment prospects are engaged in online marketing collateral, engaging more prospects by phone earlier in the selling cycle. Real-time updates to team members or other departments at various stages as critical milestones are reached in the sales process. Receive alerts on "inactivity" as milestones in the sales process are not being reached within any given time frame to quickly identify gaps and stay on plan. Include a message to your team which you can update at any time for reminders, selling tips, etc. Fewer clicks than any other solution on the planet to manage candidate information and track critical processes. Technology that sales people will actually use. 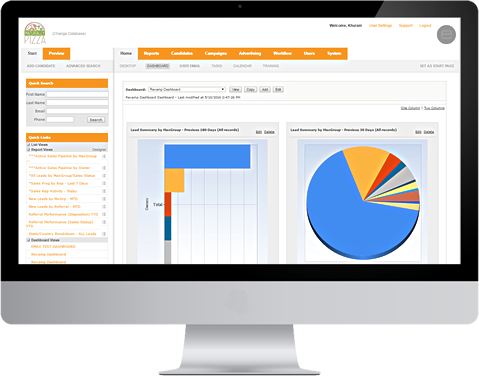 Track business processes including sales pipeline, post-sale administration and development, dispositions, ratings, and custom field data all easily reportable. Customizable candidate lists and column views to display relevant information for different types of report drill downs, group by feature to better organize and segment information. Batch management on process updates and contact management activity to save your sales team time and keep information accurate. View and manage candidate profiles in a "preview" panel without ever having to open a candidate record which reduces clicks and makes navigation easy. Check list approach to tracking sales pipeline based on years of best practices analysis to make process tracking seamless and easy. Analyze real-time information on all sales and marketing activity to make more informed decisions faster. Single click access to all reports, prospect lists, and dashboards. Easy to use, modify, and create views on the fly. Organize and monitor all sales team and marketing activity in real-time by date range across processes, lead quality, lead sources, demographics, average time frame measurements, and more. Configure and analyze business trends across different "date types" such as historical progression, status update activity, lead inquiry date, and more. Candidate activity reports on email marketing activity including drip campaigns, process specific communications, and newsletters. Don't just take our word for it. Read our endorsements. We have been with eMaximation for over 7 years. Automating our manual efforts - insuring no leads slip through the cracks, and providing real time business intelligence on franchise sales and marketing performance has been a great value in our growth. Our sales staff is equipped with daily tools to sell more effectively and our executive team has the ability to better support and manage all sales and marketing efforts. We looked at a few industry-specific technology providers and decided to go with eMaximation. Not only were they able to help us put together best practices for tracking and analyzing franchise recruitment, but their ability to focus on Sonic's specific business objectives and customize the system to match our needs was remarkable. This will be a critical tool for Sonic in streamlining our sales and marketing processes moving forward. As our technology needs have grown over the years, working with eMaximation has been a highly collaborative process. The flexibility of their system being able to consistently match our custom business requirements has allowed us to convert more prospects to franchisees on the same marketing budget. This is a must have solution for any franchise system poised for growth. There is always a learning curve when implementing any new technology solution, but the transition from our previous solution to eMaximation was seamless. The implementation process carrying over our business requirements from another system, the on-going support, and the franchise industry know how beyond just the technology ...has beat all expectations. The recent system upgrade allows us to keep a close watch on lead quantity and quality, which is critical as we evaluate marketing program effectiveness. We've been using eMaximation since 2005, and can't imagine doing business without it. For us, it pays for itself in more closed franchise sales. Coffee Beanery has been with eMaximation since 2006. The team has always been very responsive and the support services are phenomenal. This program has integrated my leads into one source that I can access from the office, or on the road and is always reliable. The email campaigns have been a successful tool in educating our prospects about our business. I would recommend this program to anyone who is looking forward to simplifying their sales process. When we conduct an ROI analysis on pipeline conversion, eMax is by far the most effective way to convert old leads to prospects, and prospects to franchisees. Since its founding in 2000, eMaximation has been a top developer of innovative, Web-based software tools that meet the productivity challenges of sales and marketing professionals. With a firm footing as the premier sales and marketing automation system in the franchise industry, and over 400 franchise brands as customers, our solution has grown into other verticals such as real estate, education, automotive, and more. We continue to be proud of our long-term commitment to helping our clients work smarter, faster, and better. Today, eMaximation is run by an experienced team of senior management focused on building solutions that meet the sales and marketing needs of rapidly growing companies. We believe in powerful solutions through simplicity and automation, and collectively and individually understand that simplifying business for sales and marketing professionals is the ultimate goal of both our products and our client relationships. To help our clients take control of their prospect and customer relationships, we understand that we must first build relationships of trust, respect, and productive interactions with each of our clients. We're constantly looking for ways to improve our solutions, so that our clients always have access to the most ideal methods of engagement with their prospects, customers, and team members. Simply is the powerful. At eMaximation we collectively and individually understand that simplify business for franchise professionals in the ultimate goal of both our products and client relationships. 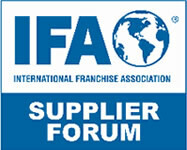 Register here to get our quarterly list of the top performing franchise portals. Built on industry-leading technology, eMaximation has been in the business of helping franchisors maximize their franchise relationships for more than a decade. We're convinced that relationships equal revenue, so why not let eMaximation help you take control and grow your business? Complete the form below and unlock the power of eMaximation. Let us show you how eMax can grow your sales. © Naranga. All Rights Reserved.